How To Be Woman Incredible In 2012 And ROCK Your Life Big-Time! 2012 is going to be YOUR year, yes? The year you get the body, the job, the energy, the ‘me time’? The year you stop dreaming the dream and start living the dream. Am I right? I know it’s going to be your year ’cause it’s also going to be MY year. Why? Because I said so! And that (coupled with the right support, knowledge and even a little daily action) is what’s going to get me there. My goals and dreams for this year are plentiful – as they always are – and I’m sure a few things will fall by the wayside as I go. You know, stuff that’s important will rise to the surface and things I thought were important will become less so. But the physical me? The health, the deliciously clean eating, and the smashing workouts? That’s here to stay! If one of the ways you’re going to make 2012 YOUR year without fail is to fully take charge of the daily habits you need to finally conquer great nutrition, training and motivation, then you’re going to like what you read here today. Today I’d like to give you an overview of exactly what the full 12-month Platinum Mentoring program entails in terms of transformational and nutrition content. As a matter of fact this is the first time I’ve released a full overview, even for the ladies who are already on board. It was all still in the works until now, but my plans are finished and it’s only fair to share them with you! Every 3-5 weeks there is a new transformation module. These are often geared around nutrition, but also cover every aspect of, well, transformation. Training, supplements, hormones, lifestyle – the works. Each daily digest within the module includes a nutrition/transformation tip that is directly related to the module topic at hand. It’s a great way to learn and create new behaviours in bite-sized chunks. Each digest contains a home or gym workout (including video), a transformation/nutrition tip, and a motivational tip. Recipes and meal plans are also part of it. And there’s a forum, so you never have a question unanswered and always have support at hand! One of the things that I’ve had feedback on from a few of my Platinum ladies is that they really loved Module 3, which was all about The Science of Great Training, and finished a few weeks ago for my foundation VIPs. The reason I decided to release today’s ‘full overview’ is that I realised that Module 3 was so popular because it is chock-full of information that I have never previously published on the blog. This is detailed stuff, and the whole idea of being a VIP is having access to the kind of education I give my 1:1 clients, but at a fraction of the cost. Because of the excitement over this module, as well as the curiosity about what is to come, I wanted to share with you as well as for the first time with my Platinum ladies exactly what is in store. why the whole ‘module’ thing anyway? As you’ll notice below, the idea is that we initially lay a foundation and basically assess where you’re at, and that after that each module builds on the previous to deepen your knowledge of ideal nutrition, hormonal manipulation, lifestyle behaviours, supplements and training for you. The initial two modules are a fairly ‘soft’ entry, and after that things really start to pick up in terms of depth and I guess ‘newness’ of information! revealed for the first time: everything you’ll learn in 12 months as a platinum mentoring client! Module 1: Where Are You Now? Learn what is actually important to track and be aware of when it comes to the way you eat; gain a clear understanding of where you are now and how your food choices are affecting the way you look, feel and function. There is also an assessment of your current eating habits, guides to how to know which foods work for you, ideal meal frequency, overview of the macronutrients proteins fats and carbs. Whew! Learn about meal timing and size; specifics on how to eat for ideal fitness, function, and (yes) on how to create the perfect diet for you to achieve a rockin’ body! I’ll teach you how to progress or regress any given workout, how to structure training for fat loss (and other goals), and how to tune in to your changing training needs. It’s going to be great! I’ll teach you the good, bad and the ugly of this prominent hormone, as well as just how you can manipulate it to work for rather than against you. Estimates are that over half of Western world women (some say up to 80%) are mildly or deeply resistant to insulin, and considering its ability to control your body fat despite how you eat or exercise it is one hormone that I know you want to know about! Everything is a pretty big call! I guess if I’m being completely accurate I should call this module ‘everything I currently know about protein’ … but that wouldn’t sound quite the same, would it? In Module 5 you will learn the key differences between animal and plant proteins and how to get the best of either. We will cover the many different important functions that protein has in a healthy body, with a specific focus on detoxification, hormonal balance, protein digestion (and what to do if it’s not quite working) and fat loss. We’ll also talk about ideal protein quantities for different types of people (including you of course! ), and how lifestyle can impact your protein needs. And, of course, there will be some super-delicious-protein recipes to enjoy. I’m extremely passionate about advancing my own knowledge when it comes to the many ways living in a modern world impacts our basic health and ability to feel and function our best. You should be equally as passionate about this topic, because the truth is that your body has to process an average of over 500 different chemicals each day! An increased toxic load can slow or halt fat loss, fog your brain, mess with your hormones, and even wreak havoc on your ability to digest and utilise a range of different foods. Learn how to deal with toxicity in the modern world without becoming a cavewoman in this important module. How much carbohydrate is too much for fat loss? For health? For energy? And how much is NOT enough, if there is such a thing? When is the best time of day to really eat carbs, how much of the stuff should you have, and which ones are the healthiest choices? Also – which ones are good choices for treat meals?! Learn all this and more in Module 7. Learn about some common factors that could be holding you back from getting results despite doing everything right. In this module we will talk about identifying and dealing with intolerant foods, about common food intolerances and how to heal your body of them, and we’ll also cover some of the popular different diets out there. We will additionally talk about treat meal rules – a crucial component of a clean diet! Cortisol is a hormone designed to turbo-charge you when something unexpected and stressful happens. It’s also what helps you feel alert in the morning and during times of focus, like training. But when life is always busy and stressful? You start to have too much of the stuff running around. Learn about adaptogens, and how to handle stress and create real balance whilst still living your busy life, and manage the effects of this (other) fat storing hormone. Seriously! Everything! Eliminating fats from your diet completely would result in death. So obviously we need them, but which ones are best? And how much should you really have in order to strike the balance between eating fat to lose fat and eating fat ’cause you just can’t stop? Learn it all in Module 10. Estrogen is one stubborn hormone when it comes to detoxing. So why bother? Well, elevated oestrogen (particularly from synthetic sources) can not only increase fat storage in your lower body (as you have a lot of oestrogen receptor sites around your gluts and thighs), but it can increase risk of all types of cancers and lower libido and fertility. It can also make you moody and grumpy, with bad breath! Definitely a module to watch out for. This is one that is very close to my heart, given my history of successfully battling an eating disorder. But personal reasons aside, a very large majority of the women I work with struggle with some form of emotional eating. If you would include yourself in this group, or if you are just sick of constant sugar cravings, then this is going to be one of the most practical modules for you. You’ve heard the saying ‘you are what you eat’, yes? Well the truth is you are not what you eat but what you eat and also digest! Meaning, without great digestion you don’t get the benefits of your food and you will struggle to detoxify stored fat. In this module we will cover good bacteria, fermented foods, raw foods and other popular approaches to improving digestion as well as some smart tips that have worked for me and for my clients. As we progress through your Platinum Mentoring you’ll notice that the knowledge just gets more in depth. We’ve all had moments in our life where despite doing ‘everything right’ things just don’t seem to be working. In this module you’ll learn about some of the underlying factors that can stop you getting results no matter how well you eat and train. And, of course, you’ll learn what to do about it. Module 15: Living the Good Life! Travel for work or please, social nights out, or just the occasional relaxed night in – there is nothing wrong with some time away from your normal regime. In fact, to avoid this would be a mistake on many levels. But if you still like to be a little bit of a control freak like I do, you’ll be happy to hear that I’ll give you smart and quick solutions for training and healthy eating while still living the good life. Sleep, stress, and results for health or fat loss are closely interlinked. Take the Woman Incredible VIP Platinum Mentoring Sleep and Stress questionnaire to find out if you could be holding yourself back. Learn about your circadian rhythms as well as the hormonal ins and outs of ideal rest and stress management. The cherry on top of a great training and nutrition lifestyle is addressing all of the little things that can make such a powerful difference. But how to know what is actually important as opposed to what just sounds good? We’ll explore organic food, making healthy eating more interesting, ideal food preparation and food sourcing, and much more! Have you ever wondered why you still have complete slumps of energy despite being quite (or very!) healthy? The truth is that being energised all of the time is probably not possible. But that’s not to say you can’t get very very close. In this module I’ll share with you the smartest and most effective energy boosting tips to maximise all of your hard work and investment. Let’s be honest. Part of the reason we concern ourselves so much with eating right and training hard is to look good! Sure, health and energy are key as well but we all like to feel proud with what we see in the mirror. Learn about some of the key nutritional and lifestyle factors to create beauty from the inside out rather than trying to paint it on! Whew! That was quite a lot to write, and presumably quite a lot to read. I have to say I’m more than a little excited about my Platinum Mentoring program given how much effort I’ve put in to ensure that the year in which you undertake it becomes your most knowledgeable, inspirational, and transformational one ever! The best part of working through module by module is that you gradually but surely will impact literally every areas of your health and wellbeing. And we didn’t even talk about what goes on in the motivation side of things today! Designing and releasing the Woman Incredible VIP Platinum Mentoring program was one of my ‘big’ goals for 2011. I hope that being part of it can help you meet some of your big goals for 2012! not yet a vip? curious and/or keen? here’s the sweetener. I will be opening the doors to my VIP Woman Incredible Platinum Mentoring and Gold Membership on February 5 of this year. That’s the first time since October 2011! AND – because I always like to add a little sweetener (or two), you will have the chance to trial either program for just $1 for your first month. With no requirement to continue beyond that if you choose not to. 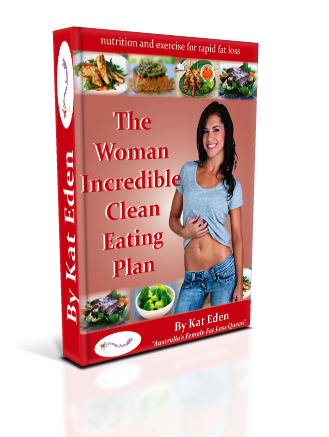 As a thank you for trying the Woman Incredible VIP Platinum Mentoring or Gold Membership on for size you will also receive a FREE introduction to the Woman Incredible Look Great Naked Eating Plan, which will be retailing at $27 when it is released in the next week or two. Your introduction includes ALL the foods I recommend for clean and healthy eating! This offer is only valid when you register as a Platinum or Gold VIP between February 5, 10am Melbourne time and February 8, 10 am Melbourne time. AND your introduction to the Woman Incredible Look Great Naked Eating Plan is yours to keep regardless of whether you continue on as a VIP after your trial! To peruse the full details of what you get as a Platinum or Gold VIP, and to register for a reminder of the February 5 special entry offer, head over here. Just for registering to be notified you’ll have instant free access to an mp3 of my thoughts and ideas on fat loss. how to be woman incredible in 2012 and ROCK your life? Just take the first step – and let me take care of the rest. Here’s to you!